A converted church features a bathroom bedroom combined in a master suite, similar to a hotel. 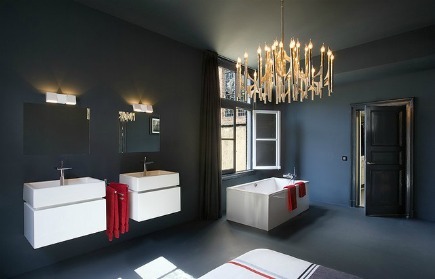 This dramatic bathroom bedroom combined in a master suite in The Netherlands is very dark, very modern and clearly a room designed for use at night. Like many older buildings, this home was once a church so the ceiling is high. Now, in a way, it’s similar to a highly styled modern hotel room. The walls are painted a deep charcoal and there is charcoal hue flooring. This creates a stark contrast to a pair white double sink vanities which are almost altar-like in appearance. The frameless mirrors over the sinks virtually disappear. The accent color for the towels is a vivid red, in reference perhaps to liturgical colors. The zero-radius style bathtub almost looks weightless in the room. which seem to float. The large chandelier has a 60s look and the silhouette is reminiscent of dripping vigil candles. We’re not shown the toilet, but I’d have to think (hope) it has its own closet. For a traditional bathroom bedroom combined space see Master Bed-Bath Merger.